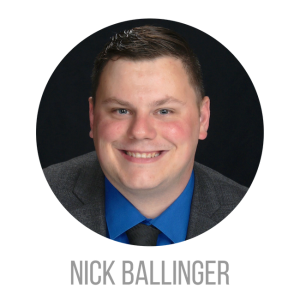 Nick Ballinger is a graduate of Talawanda High School in Oxford, Ohio. He went on to pursue his Bachelors in Psychology (Miami University) and a Masters in Business Administration (Ohio University). He worked in the mental health field for over 15 years with most of it spent at Cincinnati Children’s Hospital. Nick has always had a passion for real estate, starting at a young age when he would fix up houses with his father. This passion continued in to adulthood and investing in real estate. Becoming a licensed real estate agent was a natural progression as Nick had become someone at the hospital that his coworkers sought out for advice on investing in real estate, as well as buying and selling a home. Nick works diligently to keep up on things that effect the market like effects of staging, market trends and the latest technology in the industry. If you are looking for someone with the experience and knowledge to make your real estate transaction as smooth as possible, let Nick know how he can help. The Cincinnati Metro area has so many things to offer. When Nick is not helping others he enjoys many things in Cincinnati, such as visiting many of the wonderful parks in the area, attending sporting events to root for the home team, and spending time with his family. Aside from spending time with family and friends, there is nothing that Nick enjoys more than helping people turn their real estate dreams into reality.